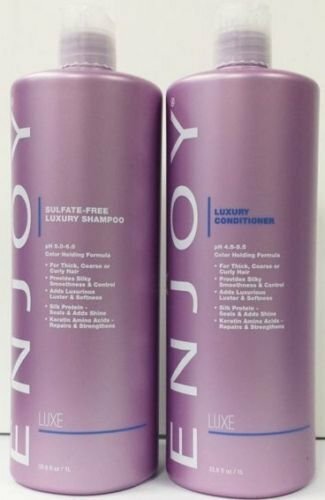 Enjoy Hair Care - 33 Ounce Luxury Duo Shampoo and Conditioner Duo - Luxury Beauty Care Products ! For hair that needs extra strength, now there is haircare that's gentle. The ENJOY Luxury Shampoo and Conditioner system contains ingredients, which strengthens hair after just one wash. This hydrating shampoo and conditioner gently cleanses and nourishes dry hair to leave it strong and silky. Rich lather and natural aromatic properties help energize and invigorate the senses. The ENJOY Sulfate-Free color care shampoo treatment protects and conditions hair for long-lasting color purity. REPAIRING: Repairing Conditioner, Smoothing Shampoo, Moisturizing Shampoo, Hair TreatmentIncludes the 33 oz. Luxury Shampoo and Luxury Conditioner. Gently cleanse, moisturize and smooth while relieving stressed out hair and scalp. This entry was posted in Hair Care on February 27, 2016 by admin.